So what am I talking about today? Well what I have to say first of all, I have to tip James Wedmore because this came from a Facebook group that he was a part of and it was discussed. James is my business guru and my go to video guy, because he is absolutely fantastic. You should follow him. Have I mentioned him before? What he was explaining was that the fact that you need experiences. Now for instance — you’re listening to me talking on a podcast. You may have listened to me yesterday and the day before and last week. You may be starting to understand the things I’m talking about and when others ask you for information, you can give them the benefit of your experiences. 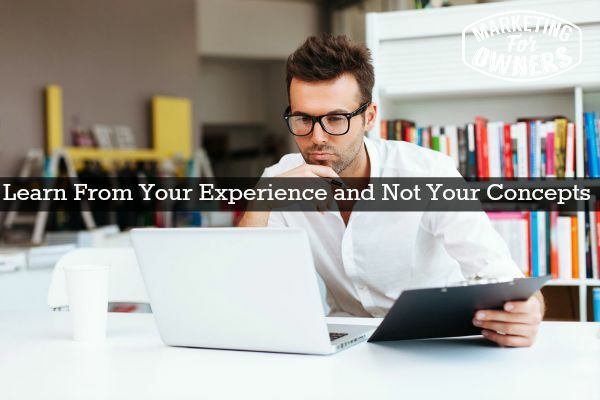 However, for them, they need to experience it themselves at this point — it is a concept to them — when they see it’s your experience and your understanding — but this time it is a concept. I have explained to you, and you have explained it to them. They’ve hopefully understood, but they weren’t there. They just pick out the nuggets and ideas, so they then need to implement to learn and to experience. Up until then it’s just a concept, a how to in the world of internet and marketing. Oh, the world of internet marketing, this is a big deal. You have people who teach things that they have never done themselves, so they hear as a concept from someone else, it’s third-hand information its sound fantastic. Because the person they heard it from was trying to sell them something online that enables them to get the result that they convinced that person they want to get. In other words– mostly it’s how to make lots of money online without packing in your job and without having to do much work — maybe for just an hour a day, maybe for half an hour a day, maybe while you’re in your pajamas. How could life not be fabulous if this was a trick? But it’s a concept so what happens is someone hears that from a marketing guru(that’s what they want to be called), and they think that’s fantastic. They buy the product perhaps they offer the affiliate commission for selling it to anyone else. That is probably one of the ways the guru says they will make money, so they go tell their friends and some of their friends buy it. But at this point that person is just explaining a concept –it is not something they know about, it’s not something they’ve discovered, it’s not something they have experienced. And that is not good. The chances are it will not work. It may not have been able to work in the first place the person who told them may not have experienced it, they may have read it or got the concept from someone else. So how will you know that? You can ask them, you can read what they say, how do you believe it. You don’t have to believe it because you need to experience it for yourself. I sound like I maybe beat the gong over and over about the same thing, but if that’s what’s it needs then so be it. Seriously do not believe everything everybody tells you. It may not be applicable to your business and that’s no good. No, you have to try it! For example — all the tools that I’ve recommended here in the podcasts and in the 71 Tools book –I’ve used. Chances are, I’ve used it that day because most of these tools you use all the time. One of my favorites is the Movie Pro app for recording iPhone videos, I’m using it right now. This is going to go into Dropbox, and I’ve made some notes in Evernote. These are the things that I use but there are plenty of other services instead of Dropbox. Now when I recommend books that I have I read, I know you are going to hear about those books in other places as well. When I tell you how to work the marketing system it is what we do here it is not from a concept. I’ve then modeled it and tried it myself and that becomes an experience that is tested and we tweak it and see if it works. And I can tell you some of these things do not work, stuff that works like gangbusters for others it does not work to me. It might work in fire safety business, but it doesn’t work in my marketing business. And if it’s not proven, if it’s not going to work for everyone I won’t tell you or if I do I’ll explain the conditions that it may not work for that it may work for this. But this is all from experiences at my fire protection business. I mean if you read anything about us, this marketing system is developed over one hundred thousand customers. That whole system has been applied to Marketing For Owners from scratch. It works, how did you get here? How did you hear about my podcast? How if you’re watching a video somewhere. This stuff really does work, so make sure that when you hear it from me and you apply it, that you bear in mind that I’ve explained it to you, but you still have to try it. Don’t just assume this will work. There are many, many aspects and many angles. Take it from my experiences and put it into your own experience. Don’t just assume. But don’t go telling other people you can, in fact you can tell people to come and listen to me and see what they think. But don’t people “Oh this guy has got this wonderful thing –do this do that”, because you don’t know — you’re just passing it on. That’s not the way to do it, unless you’ve experienced it. It’s very, very important . James Wedmore wrote an excellent piece on it. But it’s great concept and it’s a good way to never assume anything but always test it. Did I mention it’s Thursday? Yes it is time for a drive time podcast. Now today is a good one(of course they are always good but today is a quite a well known one). This is called Mixergy from Andrew Warner. It is fabulous! It’s one of the original interview shows by the interview experts and you learn from how they got to where they are and what they do. Now they do have a premium paid site where some of these experts have created lessons to teach what they do, which is a fantastic concept. 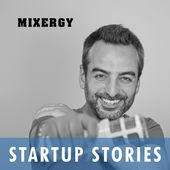 Look up Mixergy in iTunes. Also look at his website, where you will come across what’s called a welcome gate. It appears you have to opt in to get into the website. Now that’s not actually true, but what a fantastic email list builder that is something to model. You can get that for free and that sumome app, we explain it all in our website tutorials. What can you tell someone about today?